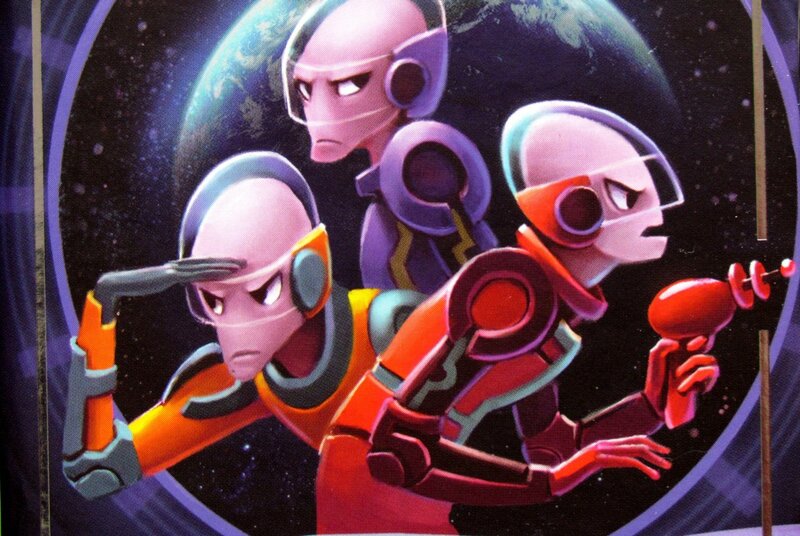 Many animated series are popular around the world. And Regular Show is one of them. 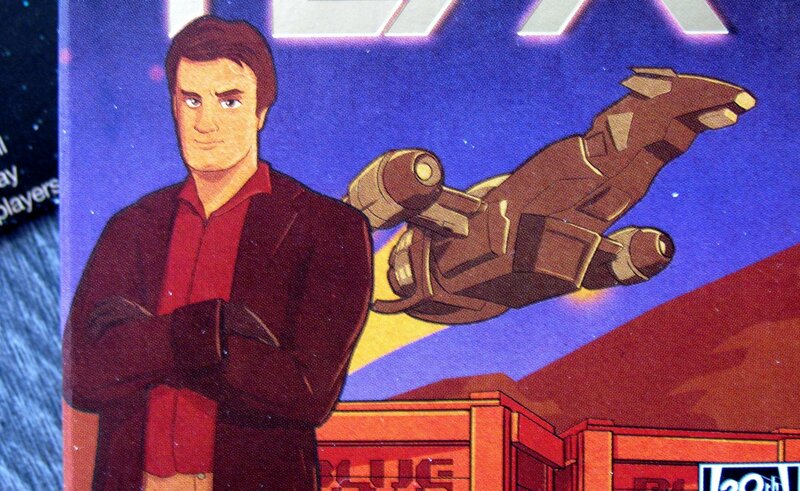 Like Family Guy, it prides itself on simple animation and not being targeted at children. Rather, it is aimed primarily at adult audiences, so they will be impressed even by release of new card game called Fluxx Regular Show. 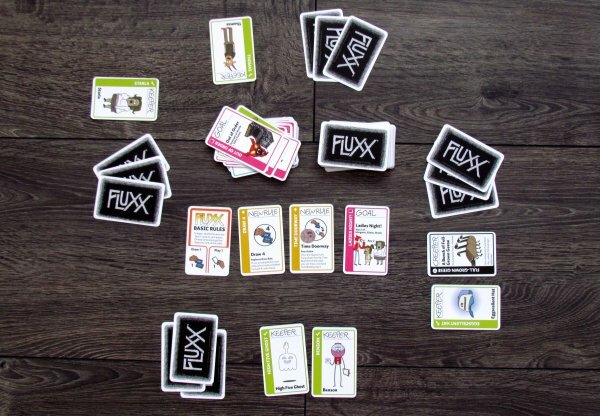 Published by Looney Labs and being a novelty for the year 2013, its a Fluxx branch. Regular Show is a series (Cartoon Network) without any hindrance, which breaks through the wall of imagination and gets on the thin ice of crazy ideas. Heroes and their fans have to work hard, because this show is definitely not for everyone. 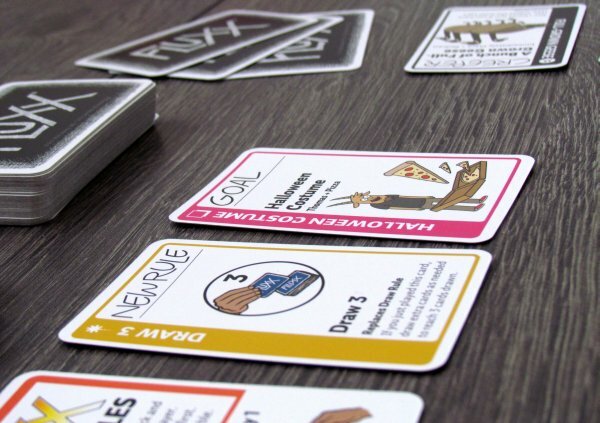 On the contrary, Fluxx is a game, that is very accessible. Together they make a truly unique combination. This time everything is hidden in a small box with two compartments. They are full of hundred cards. 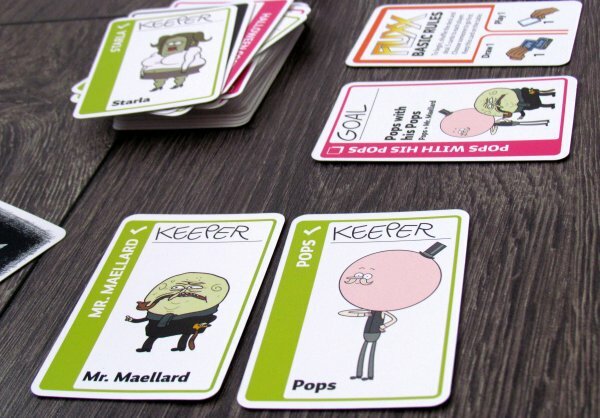 And there are no surprises, if you played Fluxx before – there are goals, creepers and keepers, action cards and yellow rules. Cards are wearing a lot of text and require some knowledge of the English language. 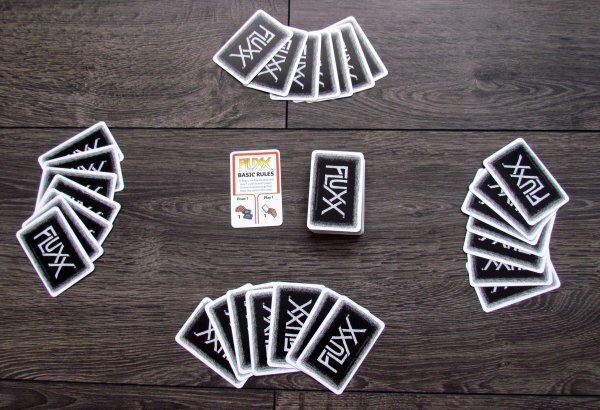 Before we will deal specifically with new version, we shall recap briefly, what is actually Fluxx about. 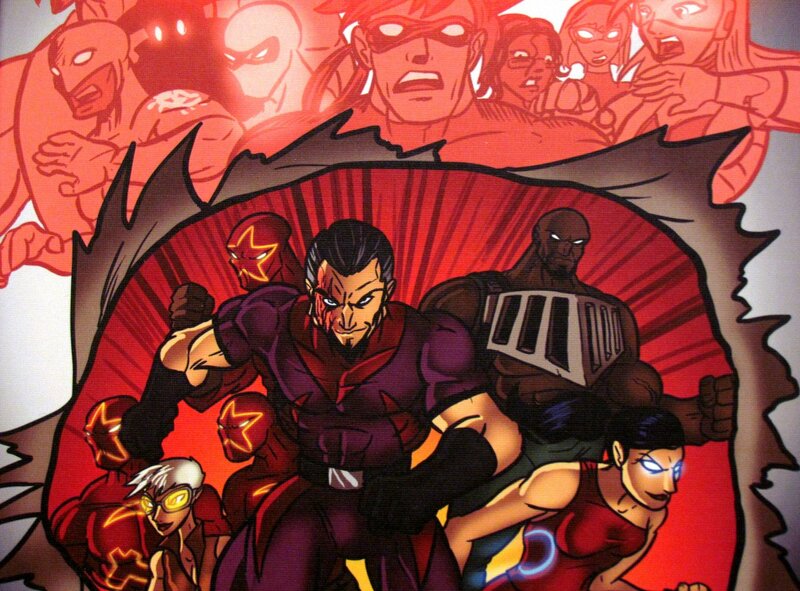 Players must act according to common rules, which are constantly changing. 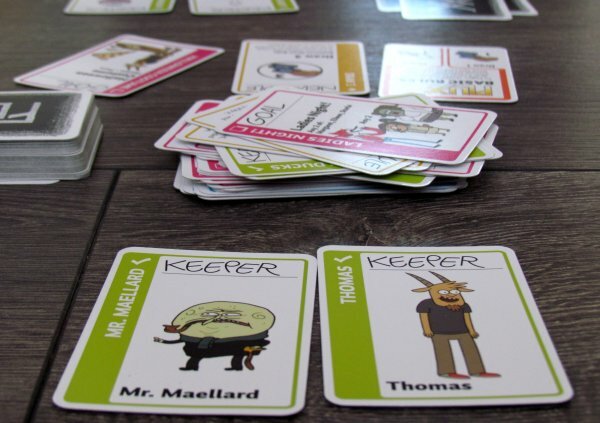 Each of your opponents draws and plays a certain number of cards in an effort to accumulate correct set of keepers (according to actually revealed goal card). Only their combination can win, when player has specific required pair of cards. 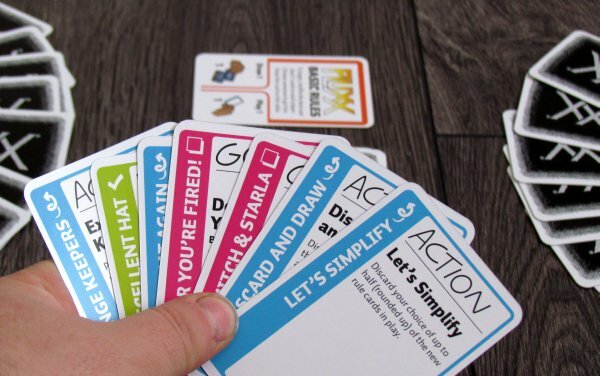 Fluxx is a game of fast, random and uncompromising card fun. Players will either love it or they hate it. It only depends on their relationship to games, where you have almost no control and still are trying to influence it. 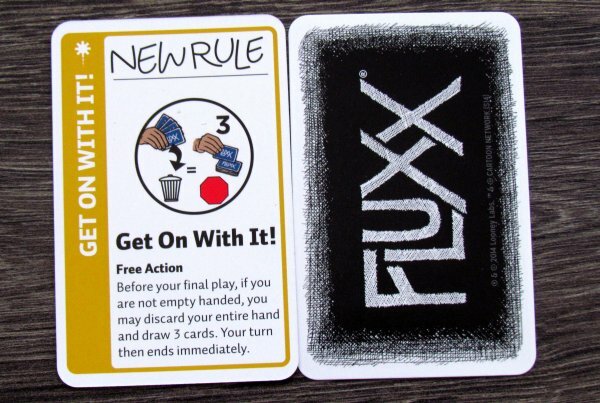 But at the same time, Fluxx provides great flexibility as well as rules and playing of every game develops in quite unpredictable ways. 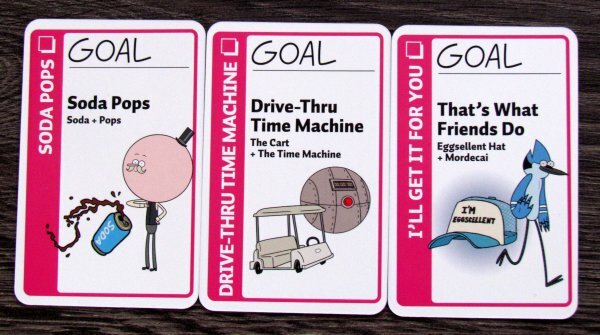 Regular Show Fluxx in this sense has certainly the same goals. 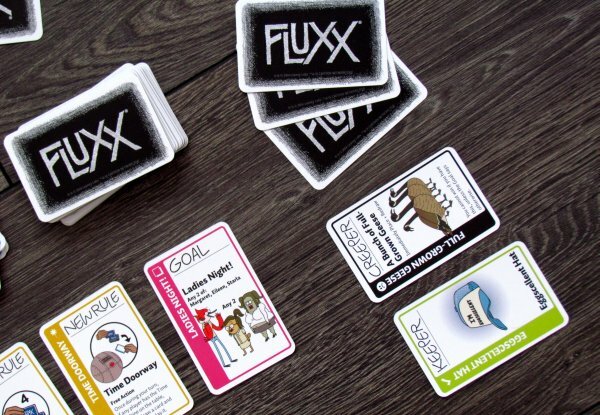 There was nothing about Fluxx as such we did not like. In new game, there is a pile of tasks and characters, that are linked to the series. It will be appreciated, of course, especially by fans of this show. 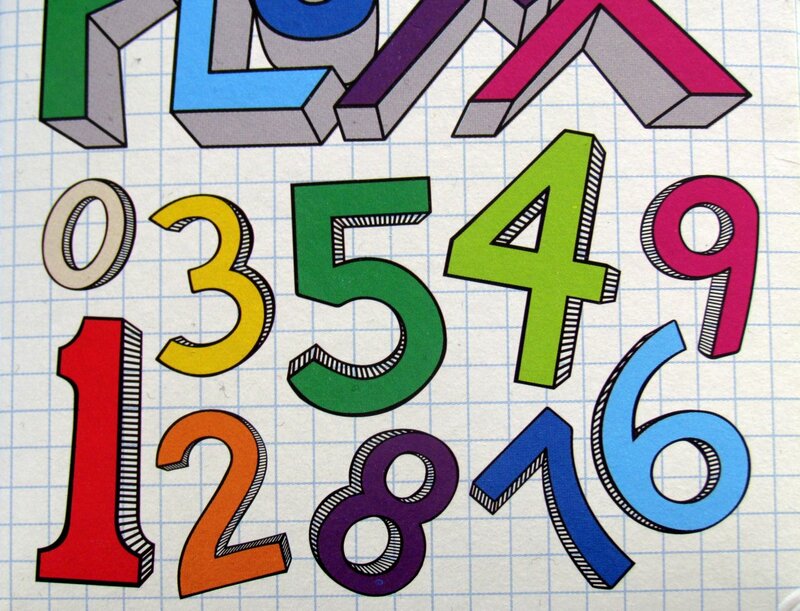 A simple illustration and funny combination of tasks operate independently and work well. 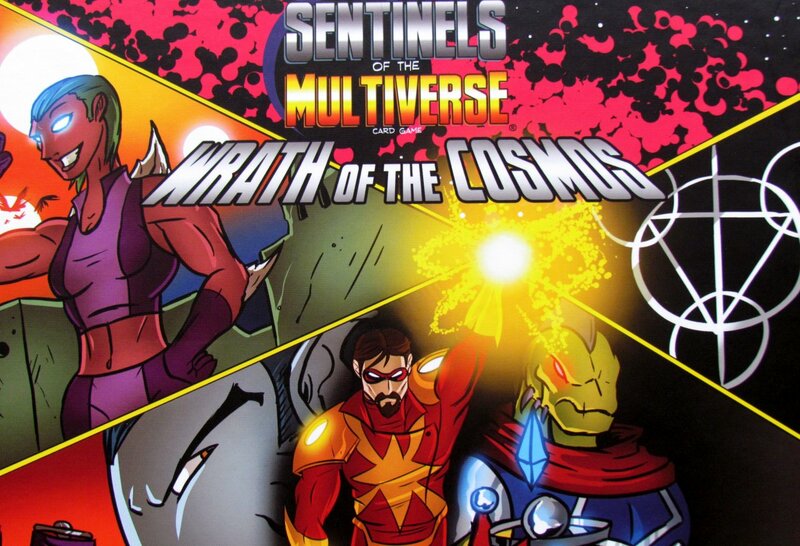 The specialty of this game is in completely new cards of rules. In addition to conventional yellow cards, such as drawing more, playing even more or having some hand limit, animated series brings its spell to this. And it allows you to bring quotes of the series to life. Then, player can draw one card more. But another time, players for example have to say “Yeahuh” for not losing their keepers. An interesting addition is card Goal Mill, which allows destruction of several tasks. Player instead gets replacement cards into his hand. This makes it possible to get elegantly rid of objectives, that you can not meet or do not want. Another option (classic) is obviously playing a new targets, one after another. New is also rule to play all the cards except one. Game time remains utterly incalculable. Chances of winning are all just a bit of luck and timing. All it takes is a bit of bad luck and rivals can cover your desired goal with their card, before you triumphantly finish it. The game is fun in two or more players, because they attack each other constantly, while following their own agenda in all situations. 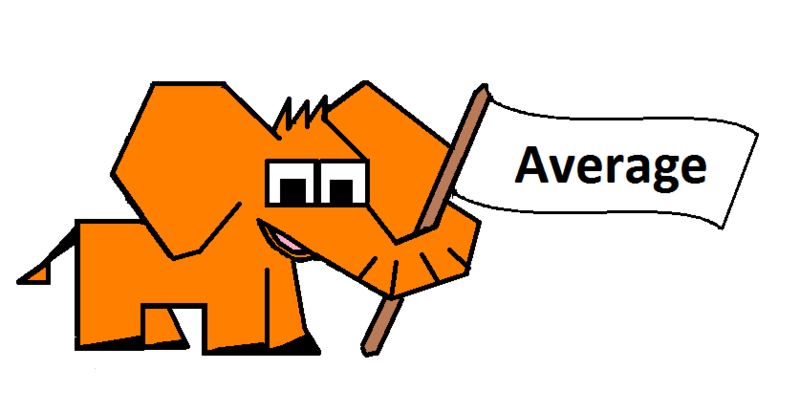 A little surprise for us is presence of only two creepers, who do not fulfill role of keeping you from winning. 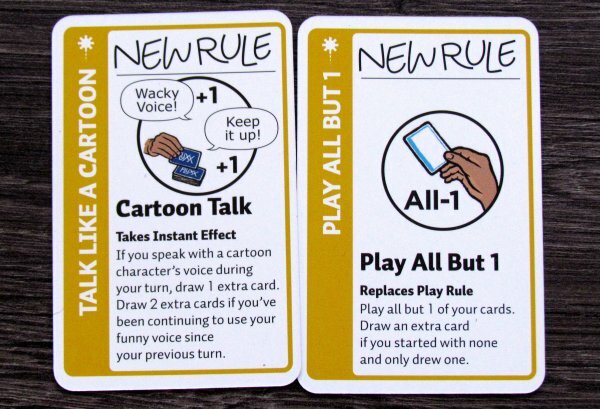 These new rules keep the game interesting for fans of the original game. 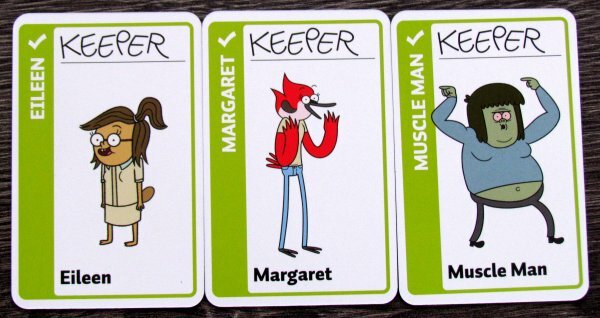 Newcomers will enjoy it more, because otherwise Regular Show Fluxx Fluxx is absolutely classic. There is not enough new cards and in the end, it does not differ much in anything. Only in topic. 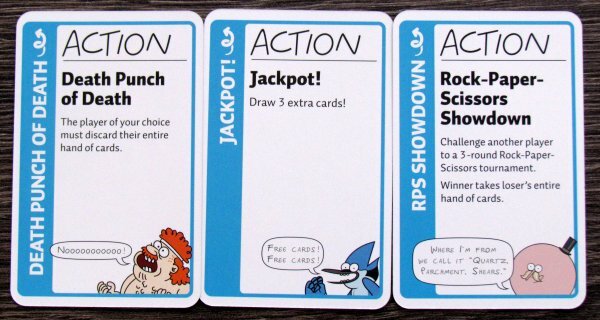 And here is the answer, whether you would might be interested in Regular Show Fluxx. Much depends on you knowing and loving this series. For fans, this is certainly pleasant news. 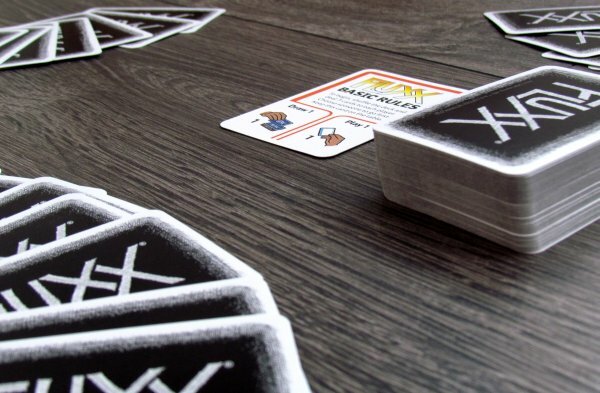 Others alike can take any other Fluxx, for example excellent undead Zombie Fluxx (review). 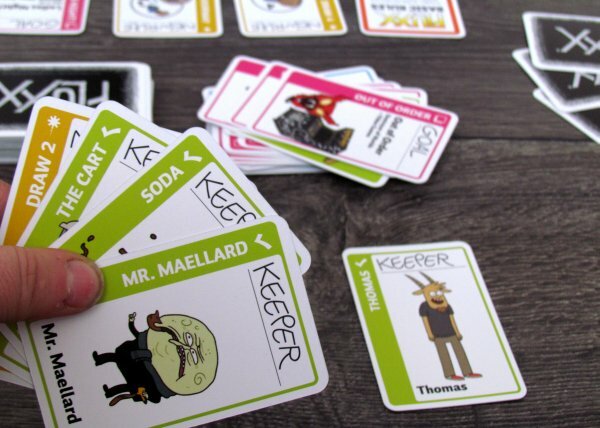 Regular Show Fluxx is another descendant of card game with chaos everywhere. But this time, we will not be able to cherish some big improvements in gameplay, only a new topic. Game flows in a lot similar fashion and the only reason, why keeping your Fluxx collection up to date, may be some new rule cards. And also chance, that you are die-hard fan of Regular Show. In that case, you can be looking forward to meeting your heroes. And this might suffice as a reason to buy it. Its still Fluxx, its still fun.